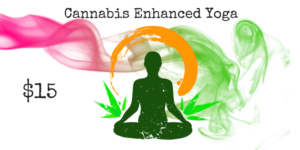 Take a journey through the depths of elevated consciousness with this cannabis enhanced yoga class. Learn techniques that will help raise your vibration and cleanse your body’s energy field. This is the perfect way to identify blockages within the body permitting a positive release of negative emotions. Each class is designed to focus on one of your seven chakras. The seven chakras are centers within our bodies where energy flows through. Blocked energy in our seven chakras can often lead to illness, so it’s important to understand what each chakra represents and what we can do to keep this energy flowing freely. Please visit our website for a quick summary of the 7 Chakras.